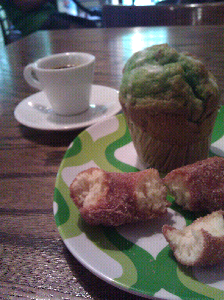 Afternoon snack at The Daily Grind in Woodstock, Vermont: decaf espresso (so I can sleep tonight) with house-made cinnamon sugar donut and pistachio muffin. I can't eat both, but the muffin was so beautiful I had to buy it and taste a corner. Notice that the muffin glows slightly green. I asked the owner and she admitted to a touch of food coloring. Even so, it was delicious.